Shark Alley is a thin stretch of water between the two Islands of Dyer Island and Geyser Rock near Gansbaai in South Africa. Shark Alley was named this because of the large number of Great White Sharks that circle the Islands and swim through the narrow channel between them. Shark Alley has just been featured in the movie Dark Tide with Halle Berry where a rich businessman pays a professional shark diver to dive outside the cage with the Great White Sharks. This is just fiction but many film crews have been here to Shark Alley to free-dive outside the cage with the Great Whites. Unfortunately before you ask it is not possible for people to legally swim outside the cage with Great White Sharks and a permit would never be given for this purpose. Marine Coastal Management are very selective about giving permits to free-dive with Great White Sharks and in recent years only Film Crews for documentaries or research have been issued with permits. The Great White Sharks populate this area in the South African winter months from April – September and are drawn to the Island by the 60,000 strong colony of Cape Fur Seals on Geyser Rock. This thin stretch of rock is an amazing spectacle to see and you will soon realise how far the sharks can smell the seals when you come into range of their pungent smelly home. The Island is a natural chum slick for the Great White Sharks and the sharks take their opportunity with the seals when they move to and from the Island out to sea to hunt. 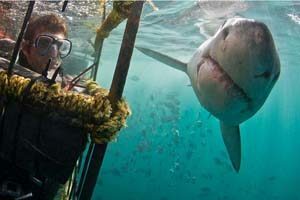 The 8 Shark Cage Diving operators in Gansbaai base themselves around the Island and many days inside Shark Alley. On most days it does not take long to attract the sharks to the boats using Tuna and fish based products. The Film crews if they receive their permits also work near shark alley and on good visibility and calm days they dive without a cage in these baited waters. The water is baited to attract the sharks but this does not put them into frenzy but tends to keep them interested in the boats and divers in the water. Without the bait the sharks are likely to lose interest quickly and move away. To date, no one has been badly injured when free-diving with the sharks at Shark Alley but this is not to say that it has been incident free or safe. Great care and caution is given on each dive and all backs are covered in the water so to minimise the risk of any incidents. Without stringent rules and complete communication underwater it is definitely possible for the Great White Sharks to get the better of divers.